OhMyTabs, according to our research, is identical to Oh My Coupons (or OhMyCoupons), and both of them are classified as advertising-supported programs. Once installed, these programs immediately start collecting data and promoting third-party services and products. These suspicious programs collect information for a purpose you might not suspect, which is to provide information to third parties. It is unclear whether this information is sold or leaked for free, but it is most likely that it will be shared with advertisers who rely on it to create offers attractive to you personally. Now, not all advertisers have malicious intentions, which is why we cannot identify all ads injected by this adware as dangerous. Nevertheless, we recommend removing OhMyTabs as soon as possible, and you can learn more about this by reading the report. 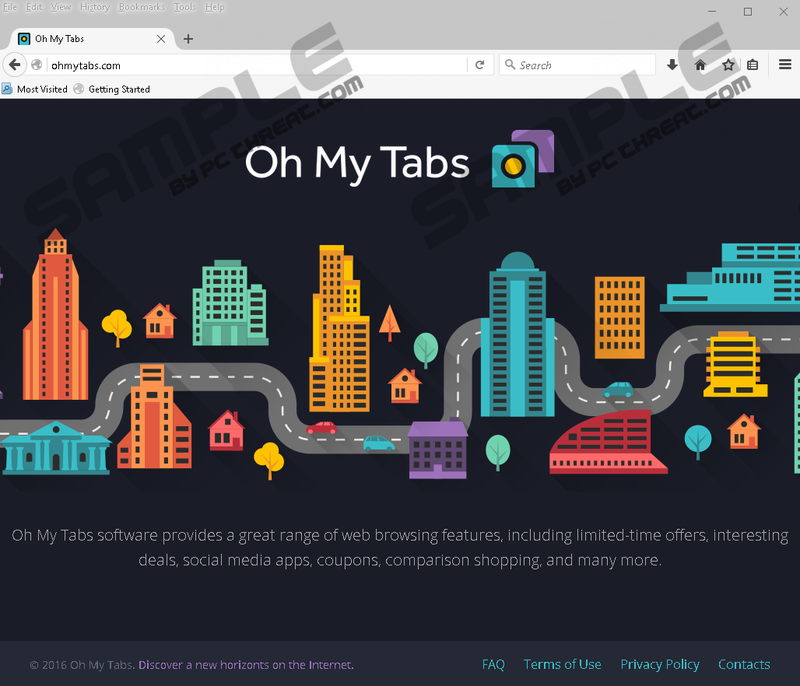 It is possible that some users have downloaded the suspicious advertising-supported program from its official download page, ohmytabs.com. At the moment, the installer on this website does not work; however, it is possible that it was active in the past. Although the official installer does not work, that does not mean that the ad-supported program is inactive itself. Unfortunately, this adware can be spread by malicious installers, and it could be installed on your computer along with malware. Have you found unfamiliar and undesirable programs packaged along with this adware? If you have, we suggest you remove it as soon as possible. If you do not see malware, you should immediately scan your operating system, and you need to make sure that you install a trustworthy, up-to-date malware scanner. Outdated and unreliable scanners might fail you, and, due to this, malicious threats could continue running on your computer without your notice. Once installed, OhMyTabs works in a very similar manner as Couponarific, Scorpion Saver, RRSavings, and other infamous advertising-supported programs. They display banners, pop-ups, interstitial ads, and all kinds of offers that supposedly can introduce you to beneficial deals. According to the statement on the official website, this adware can provide you with useful limited-time offers, coupons, and interesting deals. While it is possible that attractive deals shown to you could be somewhat beneficial, you also need to beware of misleading ads that could hide scams. Note that both reliable and unreliable ads might look the same. In fact, misleading ads could be even more attractive, and they could be created based on your browsing history. 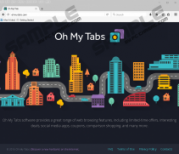 If you are familiar with the “Why Am I Seeing OhMyTabs ads” statement on the official website, you know that third-party ads are used to support the software. If you interact with these ads, money falls into the pocket of the developer of this adware for successful promotional services. Can all third parties be trusted? Unfortunately, the risk of encountering potentially malicious parties is real. If you interact with the shopping offers represented by OhMyTabs, you might be routed to third-party websites, or you might be introduced to third-party installers. In the first case, the ad could be used to boost traffic to unpopular websites or expose you to misleading content. When it comes to third-party installers, you have to be extremely cautious because you do not want to install even more unwanted or unreliable programs. Considering that the parties working with this ad-supported program are unknown, you cannot reject the possibility that malware distributors will exploit it to spread threats. Of course, this is the worst case scenario, but you need to think about it and figure out if the services provided are worth taking the risk. Whether you choose to delete OhMyTabs using the guide below or by uninstalling it via the Control Panel, you must not forget to clear cache, as well as erase temp Internet files. You can do this directly from your browser. Open it and tap Ctrl+Shift+Del to clear browsing data (the same shortcut works on Chrome, Firefox, and IE browsers). Do this after completing the steps below, and the unreliable adware will be gone. As mentioned previously, additional malware could have been downloaded along with this adware, and it could even run silently. If a reliable malware scanner detects threats, do whatever it takes to erase them as soon as possible. Our recommendation for you is to install anti-malware software. Even if additional threats are not active – which this software could eliminate – it will keep your PC protected in the future, which is crucial. Open Explorer (tap Win+E on the keyboard). Enter %PROGRAMFILES(x86)% (or, depending on your Windows version, %PROGRAMFILES%) into the bar at the top. Right-click and Delete the folder named ohmytabs. Enter %APPDATA% into the bar at the top and repeat step 3. Clear browsing history and then scan your operating system with a trusted malware scanner. Quick & tested solution for OhMyTabs removal.